Over 200,000 businesses use a Datamax label for their barcoding. With their wide range of label backings, ribbons and barcode printers, Datamax’s cost-effective products can print barcode labels for any situation. However, the wrong combination of these products can result in labels that smear, fade, or simply come out blank. Rather than waste time and money on products that don’t work, let Tri-State Business System find the right Datamax barcode label for you. Our experienced staff can analyze your business’s needs and provide you a number of different options to test. This way you’ll know your system can produce all of the durable barcode labels you’ll need. Even if you already know the type of labels and supplies you need, Tri-State Business Systems can give you a better way to buy them. We have 50,000 square feet of inventory in our warehouse that allows us to ship our orders in just 3 days almost every time. 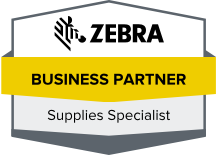 Our inventory also allows us to offer many different brands, so if you need to pair a Datamax direct thermal label with a Zebra printer you only have one company to deal with. To find out more about the Datamax barcode label supplies and other products and services at Tri-State Business Systems, contact us today. We’re happy to serve customers in Edison, Piscataway, Secaucus, New York City, and anywhere nationwide.